Nagy, I., T. Tamura, J. Vanderleyden, W. Baumeister & R. DeMot. 1998. The 20S proteasome of Streptomyces coelicolor. Journal of Bacteriology 180: 5448-5453. Just before I start, I'd like to point out that I have very little understanding of the world of biochemistry. Most of it goes so far above my head that it causes detours on major airline routes. Therefore, I don't expect you to believe a single word of what I'm about to say. Many of you who have passed through university biology will have seen some variation of the above diagram (this version from Palaeos). It shows the Three Domain Hypothesis of Woese and colleagues, based on 18S rDNA analysis, dividing life into the eukaryotes, eubacteria and archaebacteria. In many cases, you'll have seen it with a root on the branch dividing the eubacteria from the other two domains. A few years back, I wrote an essay for Palaeos on the phylogenetic relationships of bacteria. It wasn't a bad piece of work, and I'm still reasonably happy with it. Toby White wrote a much longer essay last year that largely superseded what I'd written, though I'm not sure I'd agree with everything in it (for instance, we seem to have a tacit agreement to disagree on the usefulness of sequence data). Anyway, the upshot of these two pieces was that, while said division of life has been widely reiterated in textbooks and introductory courses, the actual evidence for it is not as strong as might be hoped. The vast majority of researchers agree that there is some sort of phylogenetic reality to the three domains, but whether a given domain represents a monophyletic clade or paraphyletic grade is a hotly debated topic. 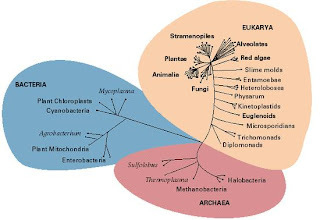 There is an even more significant amount of disagreement about what are the correct interrelationships within the eubacteria, and which members of the eubacteria are the most basal or closest to Neomura (archaebacteria + eukaryotes), whether eubacteria are monophyletic or paraphyletic. Both these points are something you may want to keep in mind as you read this post. Proteasomes are enzymes that function, as Toby has explained elsewhere, to break down polypeptide strands within the cell. 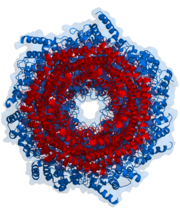 The average proteasome is roughly shaped like an open-ended barrel - the image at the top of this post (from Answers.com) shows an example looking down the barrel. Pieces of defective protein are taken in one end and chopped up into small fragments that are ejected at the other - doubtless to be recycled to make newer, better proteins. Proteasomes are a notable shared feature of eukaryotes and archaebacteria, but were believed to be absent from eubacteria until they were identified from the actinobacterium Rhodococcus. Actinobacteria are a collection of Gram-positive bacteria with high G + C content that are generally accepted as forming a distinct clade (I covered one subsection of Actinobacteria earlier). Since then, proteasomes have been identified from a range of other bacteria, including Mycobacterium and, of course, Streptomyces, and are probably found throughout the clade. Simplified diagram of a 20S proteasome in sideview, showing the terminal α-subunits and the medial β-subunits (from Answers.com). This is of some significance to the question of bacterial phylogeny, because 18S rDNA trees place Actinobacteria as one of the closer groups of eubacteria to the other two domains. Whether proteasomes are a shared synapomorphy of Actinobacteria, archaea and eukaryotes, or a feature of the common ancestor of all living organisms that was subsequently lost in non-actinobacterial eubacteria, largely depends on where the root of the tree of living organisms turns out to be. Other eubacteria possess a different but closely related enzyme known as HslV, that authors such has Cavalier-Smith (2006) have suggested to be ancestral to proteasomes. 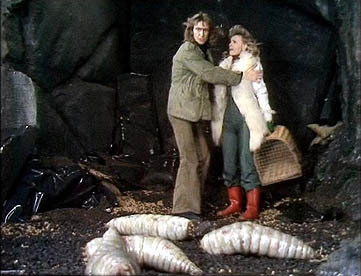 The possibility exists, I suppose, that proteasomes were transferred between Actinobacteria and Neomura by that bugbear of bacterial phylogenetics, horizontal or lateral gene transfer. In this case, I don't think that's likely. In general, the proteasome system replaces the HslV system or vice versa, which is highly suggestive of a single origin of one from the other. Only a single case appears to be known of co-existence of HslV and proteasomes in the one organism, with both being present in the Kinetoplastida, a clade of parasitic protozoans including the causative organisms of such spectacularly unpleasant diseases as sleeping sickness and leishmaniasis (Couvreur et al., 2002). Phylogenetic analysis of the kinetoplastid HslV sequence places it among the eubacterial HslV sequences rather than with the neomuran proteasomes, but is unable to resolve relationship to any particular eubacterial clade (ibid.) The available phylogenetic analyses indicate that kinetoplastids are relatively derived within the Neomura, and it seems more likely that the kinetoplastid HslV is the result of lateral gene transfer. It is worth noting that, confusingly, early diverging Actinobacteria such as Bifidobacterium seem to lack proteasomes (Cavalier-Smith, 2006), but as they also seem to lack HslV they must be regarded as uninformative in this matter. 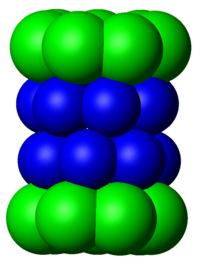 Structurally, the actinobacterial proteasome is comparable to the archaeal proteasome. In eukaryotes, seven each of different α-type and β-type subunuits go into forming the 20S proteasome, which forms the core, with the addition of several accessory proteins, of the final 26S proteasome. The archaeal and actinobacterial proteasomes, in contrast, are far more minimalist structures, with only a single α- and β-type subunit in archaebacteria, Mycobacterium and Streptomyces. Rhodococcus has a slightly intermediate state, with two different α- and β-type subunits (Nagy et al., 1998). One particular finding of Nagy et al. deserves highlighting. Activity measures of the Streptomyces proteasome found that it was inhibited by lactacystin, a result found with proteasomes from other organisms. The interesting thing is that at least one Streptomyces strain produces lactacystin itself. Could the production of lactacystin function to regulate the activity of proteasomes in the living organism? Cavalier-Smith, T. 2006. 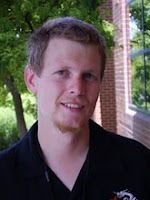 Rooting the tree of life by transition analyses. Biology Direct 1: 19. Couvreur, B., R. Wattiez, A. Bollen, P. Falmagne, D. Le Ray & J.-C. Dujardin. 2002. Eubacterial HslV and HslU subunits homologs in primordial eukaryotes. Molecular Biology and Evolution 19 (12): 2110-2117. I'm not a big fan of the Three Domain Hypothesis. Thanks for the link, Larry - I like the reviews you wrote, though I'm not sure I'd buy everything you're saying. One serious problem that I have with higher-level phylogenetic analyses of bacteria (in the broad sense - as I noted on the Palaeos page, I've never accepted the Woesean redefinition of 'Bacteria' to exclude archaebacteria, if only because it seemed so confusingly unnecessary when the perfectly useable term 'eubacteria' already existed) is that there is far too much of a readiness to assume that differences between trees from different genes represent actual differences in the evolutionary history of those genes without considering the possibility that maybe the phylogenetic signal of one or the other (or, even more likely, both) has been degraded due to differences in evolutionary rates, convergence, long branch attraction, etc. I'm not debating the existence of lateral gene transfer by a long shot, but I do take issue with the effective assumption of LGT as the apparent null hypothesis to explain differences. This is not to imply that I'm unequivocally supporting the Three-Domain scenario. Recent progress in eukaryote phylogenetics has blown the rRNA trees so far out of the water that there's no chance of them ever re-entering, so it wouldn't be at all surprising for bacterial phylogenetics to follow the same path. As much as it might seem a truism, a more holistic approach that considers as much data as possible without a priori picking and choosing which data sources are "more reliable" is required for there to be any chance of success. In the specific case of archaebacteria, I do accept that there seems good support from such characteristics as the distinct cell membrane composition that archaebacteria are a monophyletic group. I'm reasonably happy with the Neomura concept that Archaea and eukaryotes form a clade together - I haven't seen anything yet that strikes me as a serious impediment to this idea (of course, I wouldn't have read anywhere near as much on the subject as Larry Moran has). I don't like the idea that the original split was between eukaryotes and prokaryotes - fossils of prokaryotes predate fossils of eukaryotes by a couple of billion years, and that's one heck of a ghost lineage. I'm probably most sympathetic to Cavalier-Smith's idea that eubacteria are paraphyletic with regard to Neomura. Of course, anything I've said in the last paragraph I'm willing to change as further data indicates.